Increases in agricultural productivity and aggressive expansion of cropland acres have made increased demand growth critical to improving the economic situation in agriculture. With that in mind we thought it would be interesting to look at some of the trends in global corn consumption. The USDA’s Foreign Agriculture Service (USDA-FAS) collects a considerable amount of data on the production and consumption of commodities throughout the world. In this post we will rely on data from the Production, Supply, and Distribution database to examine some of the trends in corn consumption. Corn is a major commodity and is used throughout the world. According to USDA-FAS, since 1990 global corn consumption has increased 116%, from 473 million metric tons to just over 1 billion metric tons. This represents an annual average increase of 3% per year. While the overall trend in corn consumption is quite strong, it is perhaps more interesting to look at how consumption has changed in various countries around the world. In table 1 we show domestic corn consumption for the 10 largest corn consuming nations as of 2016. By far, the two largest are the United States and China. These two countries alone accounted for 54% of the world’s corn consumption. If one adds up the domestic consumption of the remaining countries in the table, their total is roughly equal to that of the number two ranked country, China. Table 1. Total Domestic Corn Consumption and Consumption Growth in the Ten Largest Corn Consuming Countries as of 2016. The table shows some interesting trends. Consumption in 6 of the top consuming countries (China, Brazil, Mexico, India, Eygpt, and Vietnam) is growing more rapidly than the world as a whole. Of these, the country that stands out as the fastest growing is Vietnam which has grown corn consumption at a very impressive annual rate of 12.21% over this time period. This has taken Vietnam from the 51st largest corn consuming nation in 1990 to the 10th largest today. On the other hand, there are several countries whose corn consumption is growing more slowly than the world as a whole. These include the United States, Japan, and Canada. One would most likely need to include the EU in this group as well. Since 1999 when the EU was formed, consumption there has grown at only 1.25% (world consumption grew at 3.17% over that time period). Most notable is Japan which actually consumed more corn in 1990 than in 2016. While the United States and China have long histories of being the largest corn consuming nations in the world, China has been gaining ground on the United States. Since 1990, China’s consumption has been growing at an average rate of 4.17%, slightly faster than the world as a whole. The U.S. on the other hand has been growing consumption more slowly, at 2.81%. The impact of this can be seen in figure 1, which shows China’s domestic consumption as a percent of U.S. domestic consumption. At the beginning of the period Chinese corn consumption was roughly half of the U.S. levels. It then went through a relatively sharp increase up to the mid 1990’s when the proportion stayed relatively flat. Then, starting in 2010 it underwent another large increase. Since 2010, Chinese domestic consumption has been at least 63% of U.S. domestic consumption. Figure 1. 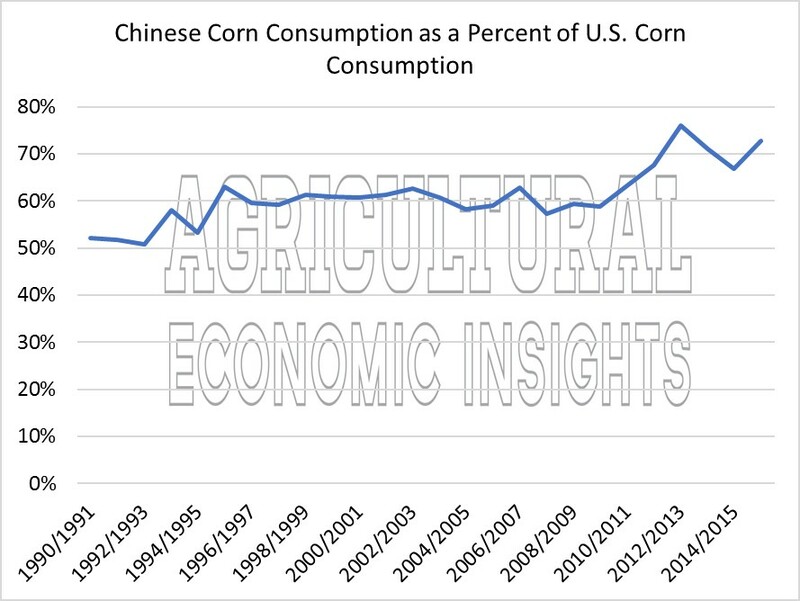 China’s Domestic Corn Consumption as a Percent of U.S. Domestic Corn Consumption, 1990-2017. Domestic corn consumption can greatly be influenced by domestic corn production, as short production in any given country can drive down consumption. Figure 2 shows the ratio of domestic corn consumption to domestic corn production for China and the U.S. China, shown in blue, generally consumes a larger portion of their corn crop domestically than the U.S. In some cases, they have consumed at a level higher than production and have recently been consuming at levels near total production. The U.S. on the other hand, has only come close to consuming its total production in a couple of years, 1993 and 2012, when the U.S. experienced major crop failures. Figure 2. Corn Consumption as a Percent of Domestic Corn Production, U.S. and China, 1990-2016. Four years of large world corn crops have turned everyone’s attention squarely to demand. Corn demand is dominated by two large players, the United States and China, which together consume half of the world’s corn crop. Demand in these two countries will undoubtedly be critical for many years into the future. Among these two countries Chinese demand has been growing faster than that in the U.S. and the rest of the world. Today, Chinese consumption has trended up to roughly two thirds of U.S. consumption. The rapid demand growth in China is an important story, because they are the world’s second largest corn consumer. They are also consistently consuming at a level close to their domestic production. 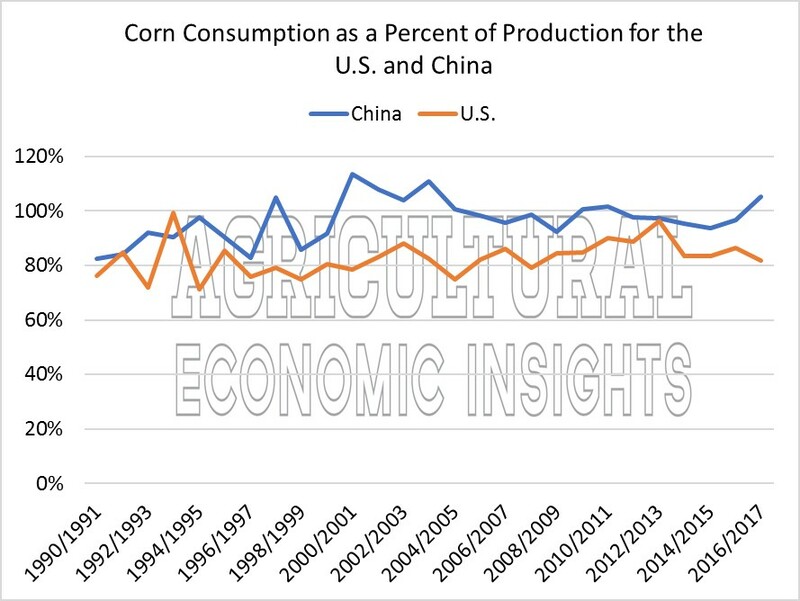 China’s continuing corn consumption growth is perhaps made more important because growth in consumption by the world’s largest corn consumer, the United States, has lagged the world average growth. Because the U.S. is the world’s largest consumer, it’s slower growth can be significant drag on increases in world consumption. Although the U.S. has grown corn consumption at a rate slightly slower than the world average, one will notice that the other countries lagging the world growth rate are advanced economies as well, Japan, the EU, and Canada. In fact, corn consumption growth in the U.S. looks robust relative to these countries, particularly the EU and Japan. However one cuts it, it seems clear that the key to future demand for corn will come from three key sources, the U.S. and China which are the two largest players, and how fast other emerging economies such as India, Mexico, and Vietnam grow.